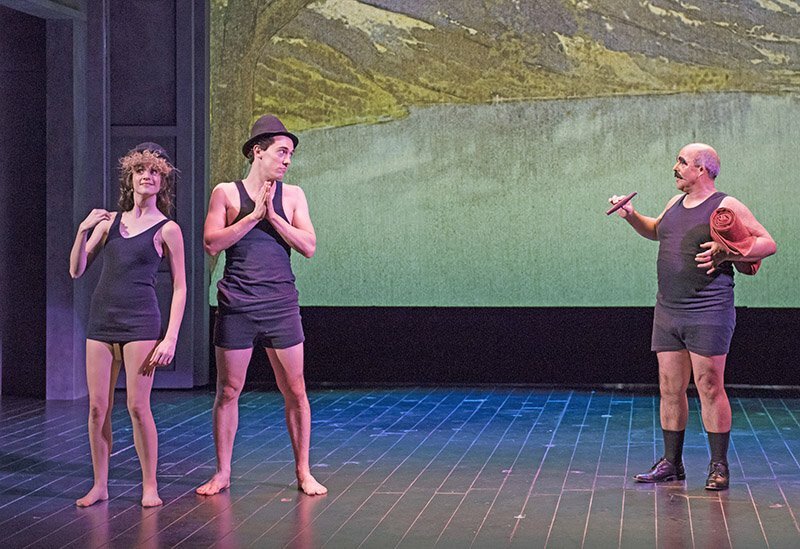 While the technology-driven call for bigger, louder, brighter sometimes leaves audiences missing the nuances of the great artworks, Tod Machover’s groundbreaking new multimedia opera, Schoenberg in Hollywood, never missed that mark. Premiered by the Boston Lyric Opera last Wednesday at the Emerson/Paramount Center, the show brilliantly depicts Arnold Schoenberg’s life, as he saw himself as well as through the observations of those around him. It hurls us into the composer’s exile—his 1934 emigration from Nazi Austria to seek a path for his music in La-La Land. The opera digs deeply into the man’s inner struggles as an artist, his reconversion to Judaism during the rise of Nazism, his reconciliation with the trauma of escaping, his sometimes violent romantic and professional relationships, and his relationship with music and art in an age of compromise. Schoenberg’s obstacles and dualities make up the substance of the show. We meet him after a classic Hollywood sepia The End prompt, when the back of his bald head materializes from darkness. A closeup of his face morphs in front of him, his eyes closed and his head shaking ever so slightly. A boy and a girl appear with a hopeful duet, singing “We are America. We are the new world. Now you are safe,” underlined by hints of atonality in the score; it is unsettling in its eerie hopefulness and sets the tone for themes of juxtaposition explored throughout the opera. As scenes from Schoenberg’s life play out in the classic Hollywood cinema style, Omar Ebrahim assumes many different personas, from Bogart to Groucho, not to mention the colossal composer himself. In fact, all three cast members, including soprano Sara Womble and tenor Jesse Darden, were tasked with portraying distinctly different characters: Schoenberg’s parents, the composers Berg and Webern, Schoenberg’s two wives (Mathilde Von Zemlinsky and Gertrud Schoenberg), and MGM’s wunderkind producer Irving Thalberg. All three showed tremendous ease in their seamless changing of roles, through subtle manipulations in articulation, tone, and delivery. Consider the complexity of the vocal writing: polyrhythmic bobbing and weaving between and among solos, duets, speech, and song, often with canonlike figures appearing in beautifully dissonant harmonies. Temporary resolves kissed our ears as the deep, silky voice of Ebrahim merged with the clarity and ethereal quality captured by Womble, notable in her outburst as a wife frustrated by living an impractical life with a composer finding his art. Darden’s performance was superb also, as an authoritative yet humorous Thalberg, Darden just as easily delivered a delicate, melancholic air as one of Schoenberg’s students, often reprising with quotes from the initial “We are America” scene. Through the libretto, Simon Robson captured a composer immersed in his own head, deeply, seeking to change the world of music while at the same time afraid to move forward. Machover’s score forms the bedrock upon which the entire universe of Schoenberg’s mind rests, aided by sublime visual production and animation, which transition effortlessly to and from vastly different eras almost instantaneously and without drawing attention away from players and narrative. Maintaining a witty undertone throughout with the use of Hollywood clichés like “Singing in the Rain”, or Schoenberg’s comical donning of his ‘SuperJew’ Shirt, an authoritative accessibility characterized the musical language. Machover and Robson married speech to song, as the polyrhythmic collisions of voices backed by condiments of electronic sounds created a vast world of sound and music, from abstract ‘quartetlike’ intimacy through 1930s Mickey Mousing to otherworldly realms that could only represent the darkest corners of Arnold Schoenberg’s mind. The 16-piece orchestra, including a pianist and a synth player, were under the direction of BLO’s David Angus. Given the responsibility of delivering a universe of sound, they were led with gusto and control and, remarkably, conveyed with clarity all of the complex ideas brought forward through Machover’s writing. The fluidity between the music coming from the orchestra and the electronic soundscape was striking, a marvel, which comes as no surprise as sound designer Ben Bloomberg, an MIT Media Lab PhD candidate, has worked with Machover since 2007, and has been masterfully imagining and creating sonic worlds with him ever since, including work on Machover’s six City symphonies as well as his robot opera, Death and Powers. Subtle amplification of voices and tasteful electronic sounds revealed a fluency of ideas that in lesser hands would hardly have made a successful marriage of multiple mediums and traditions. Machover quotes Schoenberg without being too literal, quotes Hollywood without being cheesy, and employs synths and electronica in excellent taste through a portal that welcomes all these styles and genres while maintaining an identity of its own. The score breathes and grows with the narrative and acts almost as a character in its own right. Schoenberg would smile, considering his own artistic struggles. Stage director Karole Armitage deserves special mention as the choreography and set design/change were meticulous. From the postconcert talkback, it was clear that Armitage, Machover and Robson are deeply invested in this work, and the organic exchange that seemed to exist among these three artists certainly accounts for the brilliant flow of the production. When asked about the idea of using classic Hollywood archetypes in telling of Schoenberg’s life, Machover told the story of this 20-year-long project that not even his wife knew about for the first few years. With that level of dedication behind a work combines with many great minds at work, it is no surprise that Schoenberg in Hollywood emerges so powerfully.